To easily facilitate installation of the GLV2000 into your favorite panel, we offer the Control Center. 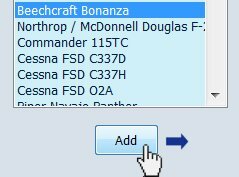 This utility scans your Flight Simulator aircraft folders and presents you with information on which aircraft are already configured, and which are not. 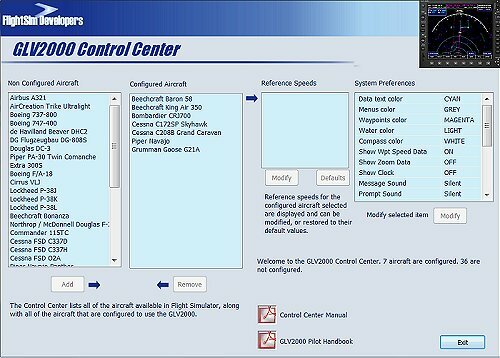 Configuring one of your aircraft is easy, and usually involves the single click of a button. · Configure your installed aircraft for Microsoft Flight Simulator® (MSFS) to use the panel instrument and systems, or restore them back to their original configuration. · Customize the speed and performance data for each aircraft installed. · Review and modify the global preference settings for the system. The Control Center is simple and easy to operate. The following handbook outlines the steps and procedures for the proper use of this utility. The Control Center is a pre-flight utility. Any changes made using this utility will be reflected the next time MSFS is started. You can review the Control Center Manual here.